One of the most notable third party releases coming up for the Switch later this year is DOOM, which held up really well in our hands-on preview; an impressive feat for the diminutive system. While we knew that the game was targeted for a Q4 release this year, Bethesda has revealed today that the launch date will be 10th November. In addition to this a new id Software developer video has been released by Nintendo, which you can view above. 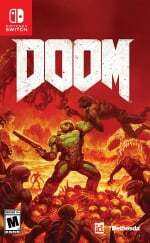 In it creative director Hugo Martin and executive producer Marty Stratton discuss the features that players will experience in DOOM on Nintendo Switch, including the full single-player campaign, Arcade Mode, and the entire suite of Multiplayer maps and modes, including all previously released DLC content. They also go into further depth about working with developer Panic Button to ensure DOOM on Nintendo Switch feels fast, brutal, and true to the experience gamers have loved on other platforms. Let us know if you are ready to bring the pain to the host of demonic hordes in November with a comment below. Bring it on, bring it all on!! Skyrim, Doom, Mario, and LA Noire!! My pocket book has never been more ready!! November 10th? Skyrim's going to have to wait. If it wasn't obvious enough already, Nintendo definitely seems to have learned from their mistakes of the Wii U era. Day 1, but no mention of voice chat! Glad a release date has been revealed. Preordered this on amazon awhile back. While I would ordinarily wish for a new cover for late ports, this is one instance where I wish that this shared the same cover as the other versions. The Switch cover art makes it appear as though the game is a port of the 1993 original, not helped by the fac that the share the same name (which I would also totally buy on cartridge if they were to port it!). Yeap got that mark, I just hope I had enough cash by then to get it as I will be getting Super Mario Odyssey first. That's a really weird time to be launching DOOM for the Switch, right before Skyrim is launching. Pretty damn crazy. Nice! Wow the rest of the year is packed for switch. This is earlier then I expected for doom! @sillygostly The cover art is more epic this way! I wouldn't change a thing. I wish more companies paid more attention to art like this. Probably the best launch year by any system, never mind just Nintendo systems. Getting rogue trooper tomorrow and then this will do for some fantastic shooting games. Great news, but I won’t be getting this one at launch as it comes in between Mario Oddysey and Pokemon. I usually don't ask for favors, but please like my reply on related tweets regarding my request from the DOOM devs to add Splatoon-like gyro controls. I will buy this game day one but only if they add gyro aiming like in Splatoon. Thanks! Day 1 purchase! Any idea if it will require extra download if we buy physical copy? A great interview. Looking forward to Doom. Not played a first person shooter since the Goldeneye re-imagining on Wii. There’s not necessarily much scope for gameplay expansion in that kind of genre. It’s good that there are much more interesting games available in terms of gameplay. I love that an FPS like Doom can be released and the developers can say there is nothing like it on the console. A refreshing return to the genre. This Fall/Winter is starting to get expensive. At retail i'll pick up Mario Odyssey, Xenoblade, Doom, Nights of Azure 2 and probably something else i forgot about. From the eShop i'll get Resident Evil Revelations 2, Zero Gunner 2 and any other Psikyo game that Zerodiv manages to release this year. @Swoltacular Only for the multiplayer. all the single player is on the cart. @FragRed I thought the same. Glad this is coming out for the Switch and soon, but my first thought was geez, what is this a week before Skyrim? Ideally, it'd be nice to have a gap so I can finish one and jump right into the next. But a minor complaint really, I'm happy both are coming to the Switch at all. Will be buying both day 1. Cant wait, less than a month! Turns out Nintendo Switch IS Doomed... Ahem. Here's a piece of advice for those of you who are looking forward to a number of Switch games on a limited budget. I actually do this every year to catch up on PS4 games that I had missed out on. Target, Best Buy, Toys R Us, and a few other retailers typically run a buy two, get one free sale in November. I'm actually planning on holding off on Mario Odyssey (my SNES Classic is keeping me busy) until the inevitable sale. That's how I plan on picking up Skyrim, LA Noire, Doom, Mario Odyssey, Mario and Rabbids, and Metroid Samus Returns. I'll pick up after holidays. Looking forward to checking out. @sillygostly the switch cover is the same as the reversable side of the cover on my PS4 copy... I switched it to this cover because I thought it was better! @sillygostly Bethesda got a lot of complaints of the cover for the other versions of the game from long time fans. Xbox One and PS4 fans WISH they got this cover standard. Wow, I didn't think it would come out before Skyrim or so close to it. I'm going to be broke next month. Hopefully so many good games going out so close together doesn't hurt sales and give companies excuses not to make more games for the switch. It’s a crime this isn’t out in time for Halloween. Can’t wait for it, have never owned a version of this. oh, won‘t preorder skyrim then. It's sort of surreal to see this video in the official Nintendo youtube channel. This one's on the xmas list which will give me time on Mario and pokemon. @BensonUii I think Gyro wouldn't work in Doom as well as it does in Splatoon, because Doom runs at 30fps, and it would make the motion controls not exactly 1:1 with the action. It's like in the plaza in Splatoon 2 where it runs slower and personally I find it kinda jarring. BotW got away with it because it wasn't as fast paced as a shooter. Not to mention I am getting Fire Emblem Warriors and Super Mario Odyssey in October. I am thinking Xenoblade Chronicles 2 is the game that will have to wait until next year. If I can afford it I will definately be getting it. Not true. Aiming in RE4 Wii edition worked fine at 30fps, and that was using simple IR pointing. Correctly implemented gyro aiming will track movements at 30/60 fps without a problem. Doomsday will soon be upon us, then? Knowing the developers have enormous confidence in the game is all well and good (Very good, in fact!) but releasing the game just a week before Skyrim perhaps wasn't the wisest move..
My wallet is DOOMed for the rest of this year! @Turbo857 Maybe, and hopefully so, but RE4 is a much different game than Doom, which is much faster paced. @FragRed I agree! I almost think they're setting themselves up to fail a bit. Most gamers aren't going to buy both games that close to each other.....throw in the new Mario game released a two weeks before this and it's a recipe for possible disaster. I would love to buy the 2 Bethesda games and both LA Noire and Mario but I'm not going to. The price would be over $200 and I don't have enough time to play all 4 games. I hope so. It would be nice to see some big budget third party games do well. Well I’ll be out on vacation then so sadly I had to cancel my amazon preorder. I will never understand people that hold off on buying games simply because of no gyro. I much rather have standard controls for these type of games. Really thinking if I should buy this since I already have it on my ps4, then again I also have Skyrim on my ps3 and pc and I will be buying the Switch edition as well. I thought this would have been a December release...Black Friday you are my only hope. Also I've played this game on PS4 without gyro/mouse and that isn't keeping me away from this game on Switch in the slightest. And then a week later they're releasing Skyrim on the Switch. Should be a good month for Bethesda and Nintendo. Not sure how different gyro from the mouse is in terms of controls implementation, but I can play fast-paced FPS games single player or online competitively at 30fps back then on my PC. Though I gotta admit players with higher end PCs who plays it at 60 fps are in a huge advantage. Wow, I won't have life anymore! The only games not ordered yet are the RE Revelations . Don't how I'm going to be able to play all of them! I didn't even finish Xenoverse 2! Saw this video minutes after it released and freaked when I saw the release date. SO SOON! The end of this year will be mind-blowing. Oddysey next week, DOOM on the 10th, RiMe on the 14th, Skyrim on the 17th, then 2 weeks later Xenoblade. Can't wait! It's DOOM, Mario, and Fire Emblem Warriors for me this Christmas! I'll probably get 1 of them in the fall, and then the other 2 in December. @tourjeff Oh geez I forgot about Resi! I'll definitely be buying Revelations 2 for that sweet co-op action. Anything that is not Mario Odyssey is going to take a back seat to this. Ugh time to beg for overtime. @sillygostly I actually like it better. It doesn't suffer from guy in the center with text over him syndrome like so many other box arts. YEEEEEEESSSS just in time for my birthday! I told my fam to put this on my birthday list when it was announced, but I was starting to think it wouldn't be out in time. This is perfect! If you've ever felt frustrated at companies like Capcom or EA or Activision and their middling support... this is how you show them what's what. Go out and support DOOM. Go support Skyrim. Go support L.A. Noire. Make these other companies lament seeing their missed opportunity. Make them regret their lack of support. I will plan on buying this version of Doom on launch day, or as close to it as possible. Odds are I’ll go hard copy - but digital isn’t completely out of the question! @NinjaWaddleDee totally understandable! there are so many games being released towards the end of the year that it's hard to keep track of them all! I've just remembered another two on my purchase list: Payday 2 and the physical NBA ! @JaxonH Exactly. Any interest at all just buy it. The companies that do support Switch then will come back for more and those that don't may regret it. I have it on PC but I really want it on here even more. I think the dedicated controller would help it play a bit better too and being portable is a big plus. Skyrim I'll grab too, only way I could see myself really committing it on the Switch as the PC would just distract me. I could easily put BOTW hours on that one in this format. ...and then comes Wolfenstein. Bethesda is being a trail blazer let's hope others learn from their work well. Knockout holiday lineup, that's for sure. I still don't have a Switch lol. I am getting this! Super excited can't wait for November 10th. ....I'm going to double dip aren't I? Just to see it running if nothing else. How have they done this?! Personally, I played 7 levels of “Doom” on my PC before getting swept into other games (it is EXCELLENT), so it’d be fun to restart and finish it this time on Switch, where portability makes a huge difference in my ability to find ample playtime. My only hesitation lies with my existing plan to purchase “Skyrim” the very next week; I played that one on PS3 extensively, but never bought the DLC, and I think this new (to me) content alone will justify re-investing and using portability as a means of really seeing it through. Day one, physical purchase for me. Can't wait! I’ll wait for a gyro support...propably until another game does it. My preorder will be going up shortly. I have the PS4 version and the Switch box art is the reversible image. I have my PS4 copy with this as it reminds me of the original cover art. I really dig it. Does this have local multiplayer (actually on the same system with one game)? I need that gyro aiming, though. Once you get it, it's hard to go back! Really want to have Doom on the go. @faint This is my problem now! Skyrim Switch is one of my personally most anticipated games coming out. But I did NOT expect DOOM this soon! Now I have the dilemma of which to buy now and which to get later. :'-( Its a great year to be a Switch owner. Best console launch year by far out of any system I can remember (and I've been playing since Atari)! I seriously am shocked this is coming out so soon! CFGK24 IS WAY TOO EXCITED! @cfgk24 Then PanurgeJr will forgive cfgk24 for both the use of the 3rd person and forgetting to turn off the caps lock. For PanurgeJr understands. I'm still struggling to figure out how I'm going to afford Fire Emblem Warriors and Super Mario Odyssey THIS month. Or how I'm going to get time to play them... I have to admit that I'm tempted by both Doom and Skyrim though. Great news. I think many gamers might want more red on their console by Christmas, and the usual candy cane flavour of the colour might not do the trick. Doom might well scratch that gory itch for Ninty fans. @nab1 first time I tried gyro aiming was Uncharted on the Vita, definitely 30fps. Worked like a dream, would have been really hard to aim without it... the Vitas sticks were tiny! @PanurgeJr at least I managed to correct the autocorrect from typing 'exited'. This really is shaping up to be a holiday Nintendo can not lay claim to in first and third party quality since the SNES period. Not to burn on the Gamecube which exceeded the n64 and Wii/WiiU in such options but it never saw this much A to AAA material in a short period of holiday shopping season time. In the last quarter of the year Switch has Fire Emblem Warriors, Super Mario Odyssey, DOOM, Skyrim, LA Noire, Sonic Forces, Xenoblade Chronicles 2, Lego Marvel 2, WWE, NBA (retail), Rime, Gear Club, Syberia 1+2, Just Dance, Constructor, Farming Simulator, Telltale Batman, Nights of Azure 2, Gunvolt (retail), Axiom Verge (retail) and maybe Payday 2, Battle Chasers Nightwar, Redout and Yooka-Laylee. The Wii U days are over. Hurray! @electrolite77 it's a good year to be a Switch owner. next week i pick up fire emblem warriors,mario odyssey,nights of azure 2,Nba 2k18 and next month skyrim and doom so many games.......R.I.P wallet. So that puts me up to eleven physical retail games coming from 20 October through 01 December. I think. Probably more. DOOM is gonna be a seller for the Switch... especially making its mark in the Top 20 Switch eShop Charts. Great! Now we have our DOOM, when will we get the elusive GLOOM? I am Reggie but my wallet is not Reggie... LA Noire and Skyrim too?!? what a week. How big is the download size of this doom thing? It's easily 40gb on PS4. @Spoony_Tech I agree. The Switch cover art is way cooler then the other versions. Doom guy for Smash Bros. Already preordered it. My wallet will be busting out its seams with these five games, I am getting in November alone for the switch. @sillygostly Uhhh, no it doesn't. The new cover is almost completely difrerent from the one of the first game. The only thing it shares is the positioning of DOOMguy and the demons.